Dr. Moore, a native of Gray Georgia, graduated with honors from the University of Georgia with a BS in Biology. She received her Doctorate of Dental Medicine (DMD) from the prestigious Medical College of Georgia. While at MCG she completed her seniors honors clinic rotation in both cosmetic and pediatric dentistry. She joined her father in Practice at Gray Dental Associates in 2005. Her father started Gray Dental Associates in 1975 and they have prided themselves on maintaing a high level of quality dentistry for nearly 40 years. Dr. Moore served the Central District Dental Society as President 2010-2011. She has served on the Georgia Dental Associations Board of Trustees and is currently holding the office of Delegate to the American Dental Asociation. She is also a fellow of the Pierre Fauchard Academy which recognizes doctors for their professionalism, integrity, and ethics worldwide. Dr. Moore is actively involved in the community of Gray and Jones County. She is a member of the Rotary Club of Jones County and serves as Vice Chair of the Jones County Board of Health. She also serves as a 1st grade Sunday School teacher at Gray United Methodist Church. 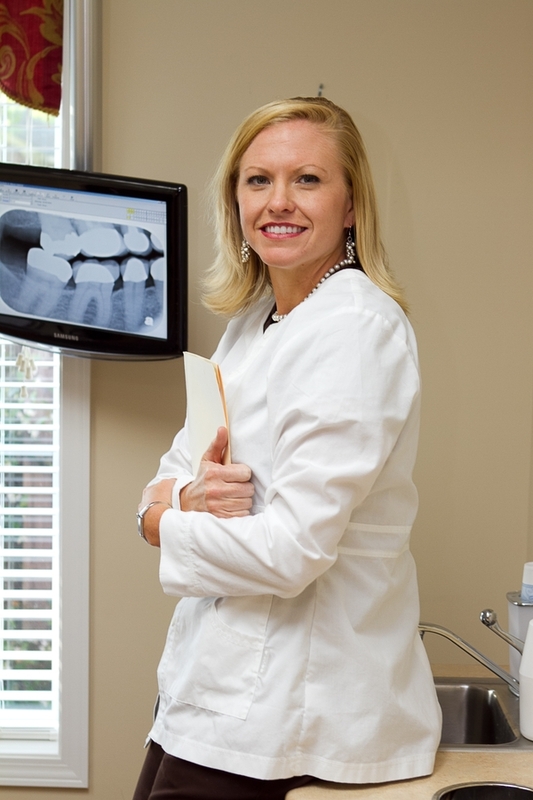 Although dentistry is a huge part of Dr. Moore's focus, her true love is her family. She is married to Geoffrey Moore, a teacher and coach at Howard Middle School. They have two children, Griffin and Pierce, which keep them very busy. When she isn't busy with the every day duties of a Mom she enjoys playing golf, running, water skiing and working in her yard. Skill and compassion go hand in hand when providing exceptional patient care. As a dental professional, I stay up to date on the latest advancements in cosmetic and family dentistry in order to provide the most current treatment options for my patients. As a doctor, I recognize that my patients are unique individuals who have placed a great deal of trust in me and my team. I truly value each and every patient relationship and I want you to feel comfortable being a patient at Gray Dental Associates. We are proud of the friendly small town that we belong to and hope that you love us as much as we love being a part of this community. I appreciate the time you’ve taken to visit this site and find out more about this dental practice, my team, and the many services we can provide to help you achieve optimum oral health. If we can answer any questions for you regarding your treatment please do not hesitate to call us at 478-986-6821.